Evaluate your garden spot. It is important to consider the sunlight throughout the day in any chosen garden spot. Proximity to water and easy access to it so that you can watch it and enjoy it daily, are also things to think about. Pick the right plant(s) for your garden. Do your research and learn what types of plants grow well in your area and during this time of year. Try consulting with your local plant shop or the internet for ideas. Placement of your plants is important. Shorter plants should go on the south side and taller ones more north so that their shadows do not affect the growth of others around them. Knowing the amount of water your plant(s) requires it most important. Both overwatering and under-watering can be damaging. It is also recommended to water in the early morning to keep as much moisture as possible in the plant. Fertilize and pull weeds. Tending to any plant consistently is important. 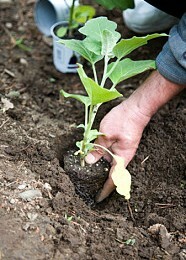 Looking for weeds and pulling them is necessary to keeping your plants healthy. Also, proper fertilization is helpful to growing strong plants. Try placing dried crushed egg shells around your plant as a fertilizer!